Hello everyone, today I will tell you about how you can learn model your mobile Apple gadget - iPad or iPhone. In fact, it is very easy to do this - you will need a little perseverance and a few minutes, even seconds, time. There may be many reasons to find out the model of your iPad or iPhone, but the most common reason is to check your mobile gadget from Apple for originality. 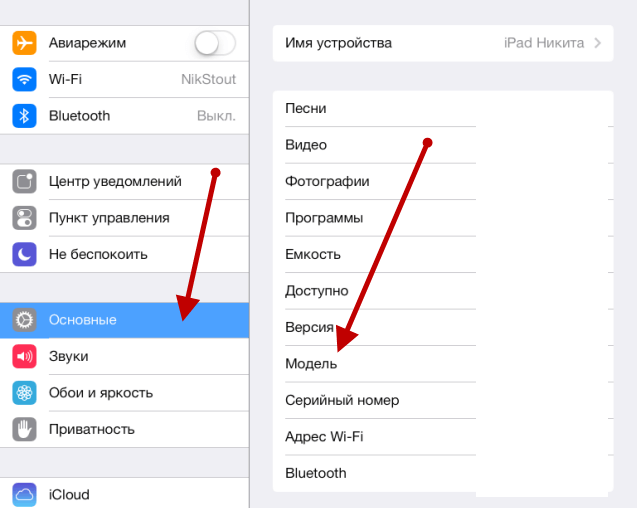 Open the settings app on your iPad or iPhone mobile gadget. Usually this application is located on the main desktop of the device. If it is not there, you can search on other desktops. For those who do not know, the settings application icon is a gray square with a picture of several gears in the center. 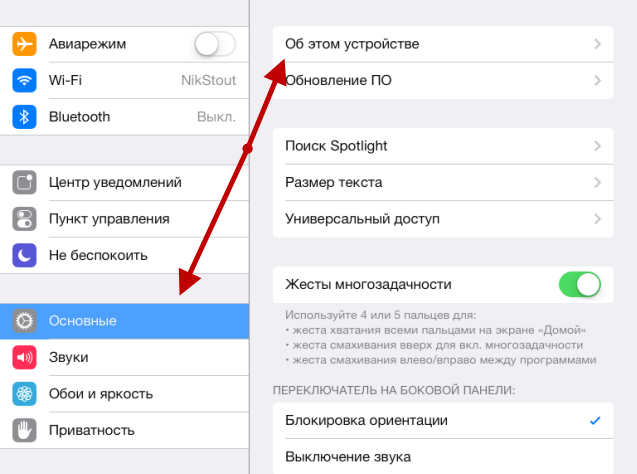 Next, in the settings you need to go down the menu items below, for this you can use the swipe gesture - swipe. Locate and then select main. If you have an un Russified version of the operating system, then you need to select the General item. Further, until the cherished information you just have to select the item "About this device." It is understood that before this you have chosen the main item, as written in the previous step. Information about your iPhone or iPad mobile gadget will open. Including the information provided, you can find out the model of your device. To do this, use, respectively, the information from the model section. If, of course, an even easier way to find out the model of your mobile gadget is to look at it on the back of the gadget. But I don’t really like this method, because you can write anything on the cover. Flip your mobile Apple gadget - iPad or iPhone, find a very small text at the bottom of the cover. Look carefully at this text and find the model item, there you will find out the model of your mobile gadget. So simply and without unnecessary gestures, you can find out the model of your mobile gadget from Apple - iPad or iPhone. As you could replace with this method you can find out not only information about the model of your device, but also a lot of other useful information, for example: the number of photos stored on the device, the number of musical compositions, programs. Also I recommend to pay attention to the item "Serial number". I recommend that you write down this number, because Apple’s mobile devices are not so cheap, you never know what can happen, as the saying goes, god saves. I would be grateful if you leave comments on this small note, your opinion or addition will be important to other readers and users of this article. In order to leave a comment, use the comment form below. Since the commenting form is from the social network Vkontakte, in order to leave comments you need to log in to this social network. I also recommend that you familiarize yourself with other undoubtedly useful notes on this resource, undoubtedly you will find here a lot of useful information for yourself..